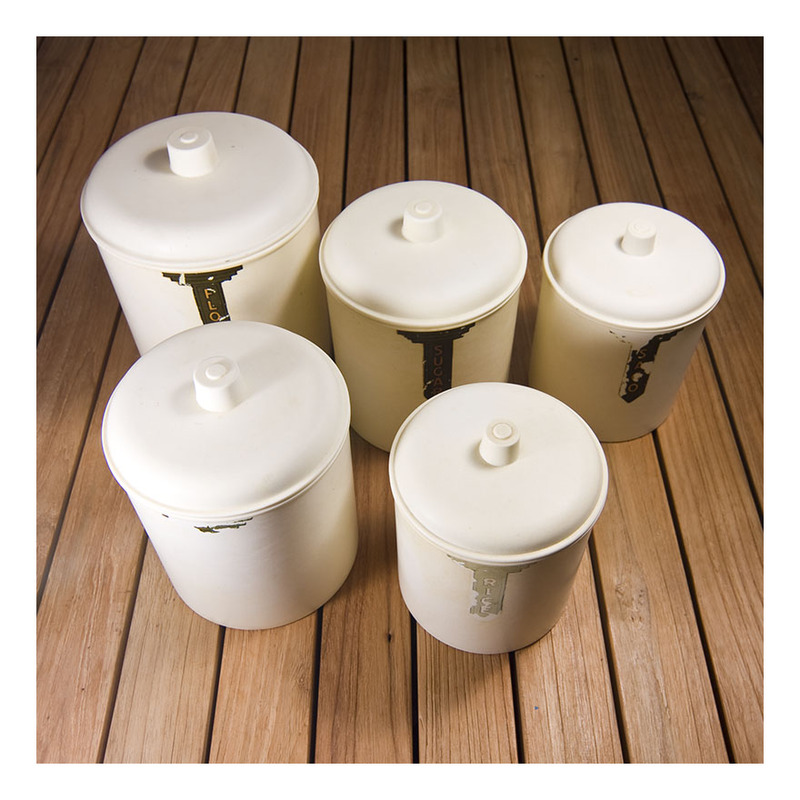 Eon is a well known Australian bakelite manufacturer of the 40s and 50s- specialising in kitchenware and especially canisters. These two cake canisters are from different sets, but they were both produced in the 40s and both feature the red and white colourway- so beloved by modernist kitchens of the 50s. Both lids still fit snuggly, thus keeping said cake fresh. And both are unblemished, the bakelite as shiny bright as the day it left the factory. The red-lidded canister is not labelled, but it’s clearly for cake. The white canister has that typical 50s cursive bakelite label pinned into the side of the canister. Bakewells started production in 1884 and like so many potteries, moved from making industrial pieces [bricks and pipes] to domestic wares in the early part of the twentieth century. By the early 30s Bakewells was making pudding bowls and banded mixing bowls in multi colours- all to meet the insatiable demands of the new middle class. Bakewells was in Bexley, in Sydney and is now very well known and very collectible. Particularly collectible are the banded bowls like this blue one- they can also be found in yellow, purple and green. 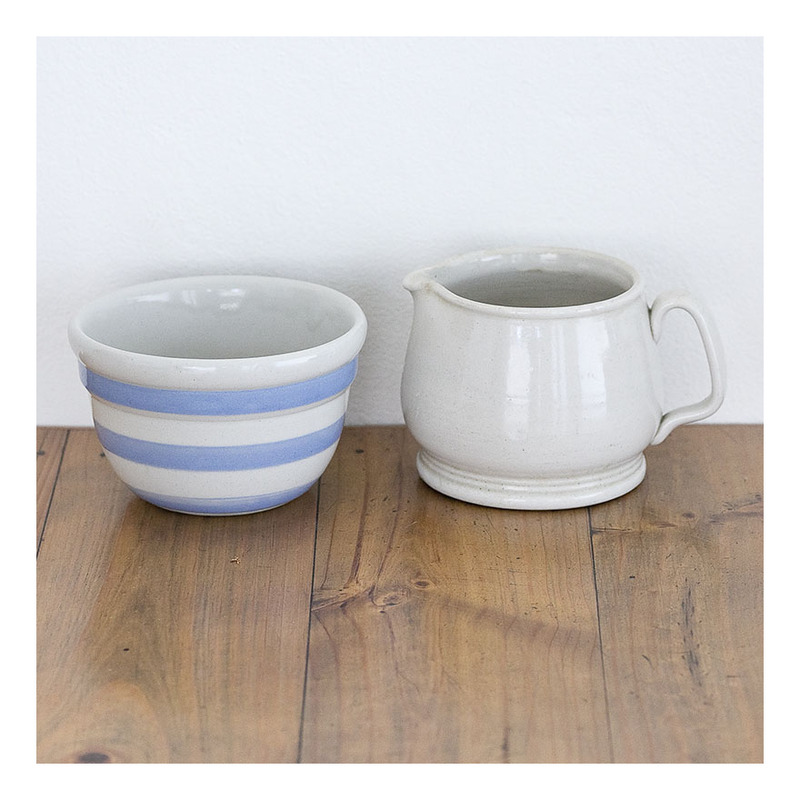 The matching jug- with its 30s post-art-deco styling is made with the same off-white glaze. Perfect for the contemporary kitchen! 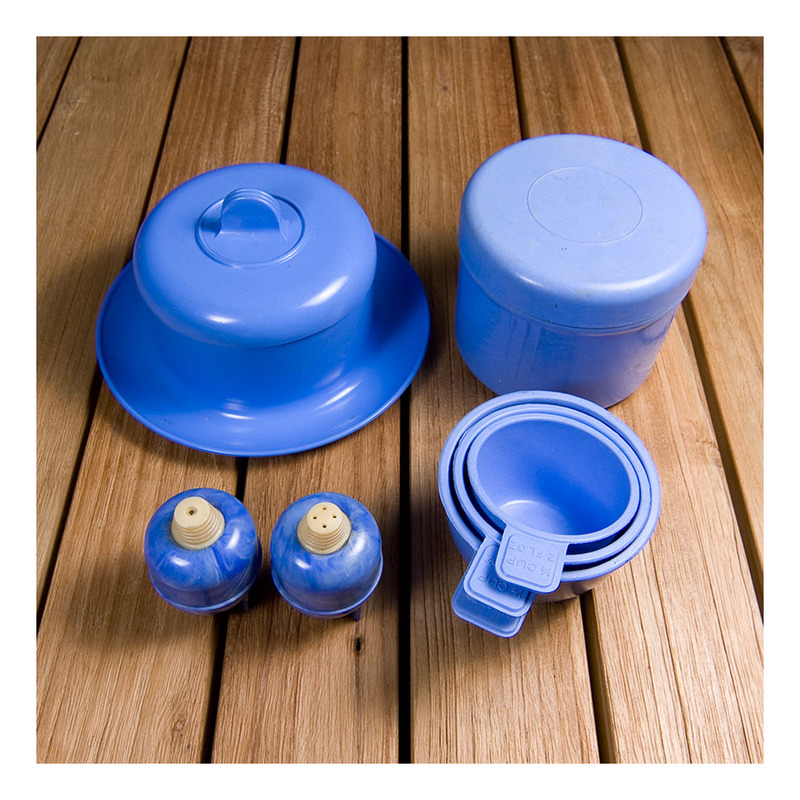 Bessemer products – made from melamine – were made by the Nylex Melmac Corporation which started production in the mid 60s. These beautiful pieces were designed by Lionel Suttie-an industrial designer-and were produced in Melbourne until the mid 70s. It’s interesting that Mr Suttie is remembered as Bessemer’s lead designer: this was the first time that condiment or tableware made from plastic [melamine] was thought to be worthy of design – that the humble mass-produced sugar bowl could make a design statement. 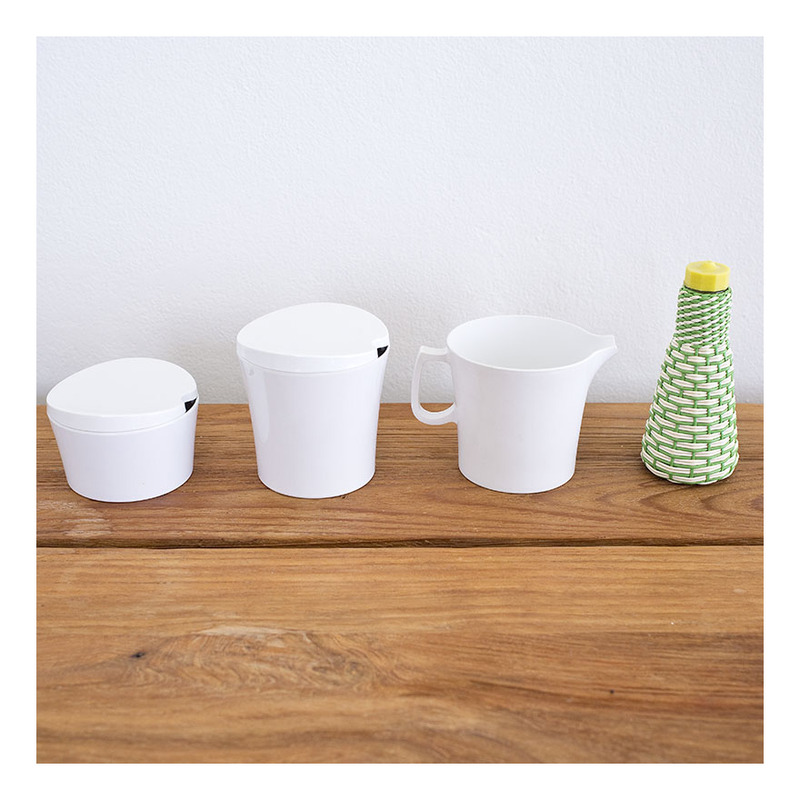 And this set of three- two lidded condiment containers and a jug- is rare in that it is white and has never been used. This set can be used as intended- melamine is a strong plastic resistant to scratching and the set is ‘as new’ – or they can form part of a funky 70s display. I have teamed them with a hand-woven white and green raffia oil bottle- also c. 1970s- as a visual contrast. 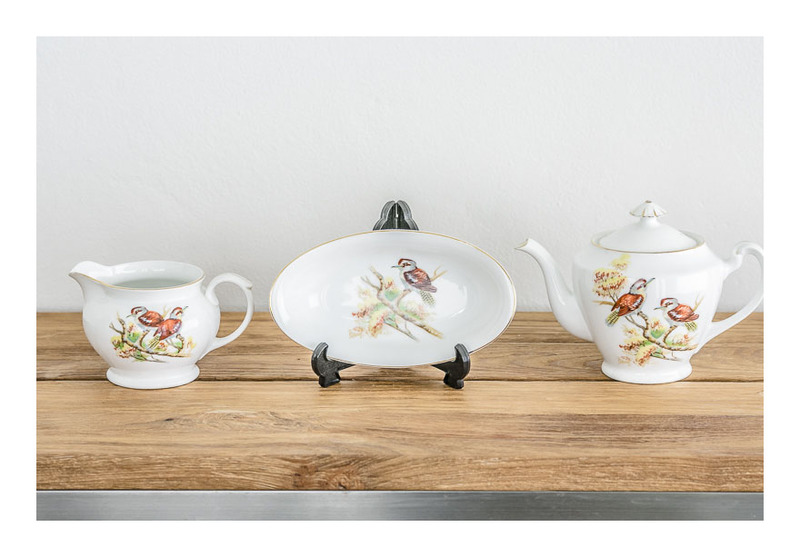 I have shared my fascination with Diana Pottery many times on this blog- and having just sold some iconic Flannel Flower pieces, thought I’d post this rather more kitschy ‘prawn’ collection. Picture this: it’s the mid 50s in Australia. Nationalism and modernism are joining forces in artistic expressionism and so Diana comes up with : prawns. Prawns as an emblem of a new national dish. Prawns because we have whopper sizes in Australia. Prawns, because they are easily rendered in clay and are a simple, easily recognised form…and prawns because- well every other national dish was already taken. 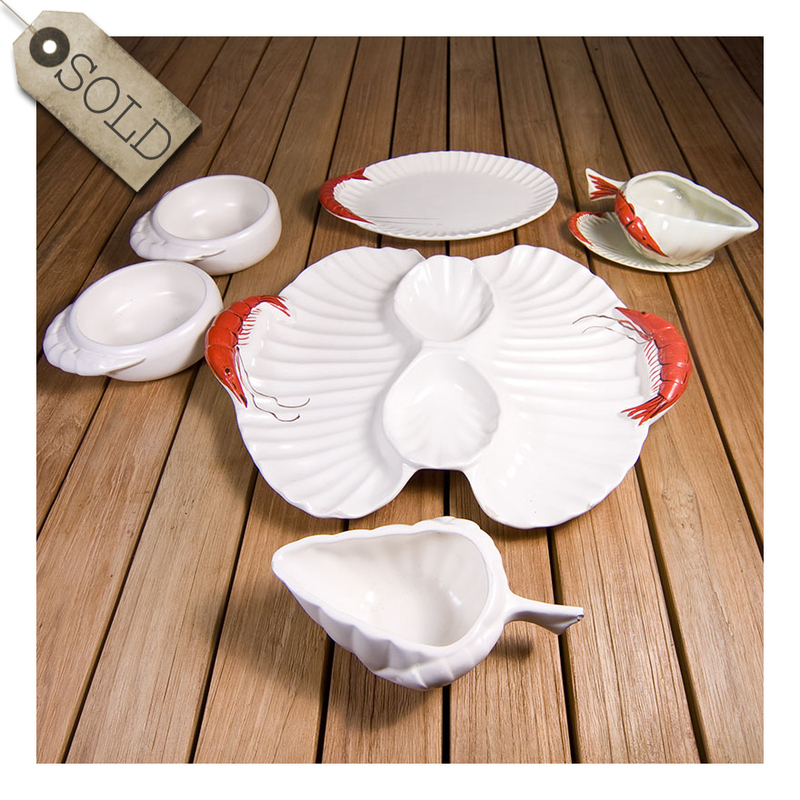 We see here a large platter with fluting and capacity for two different dipping sauces in the middle; a sauce boat and saucer [presumably for tartare sauce] and a side plate- all with painted red prawns as handles, and the same fluting. Accompanying these are two ramekins and a sauce boat – with handles in the form of prawns, but unpainted. There is much conjecture in the world of Diana collectors as to whether the absence of colour/paint/glaze on these matt white pieces is intentional, or whether they were merely unfinished. There are many pieces that have the same moulding or casting of figurative elements as pieces that were hand-painted but were sold unpainted- vases, plates, ramekins, the lot. My own feeling [and completely unsubstantiated opinion] is that the unpainted pieces were entirely intentional…one could mix and match with the painted pieces and not be quite so overwhelmed with bright red prawns. 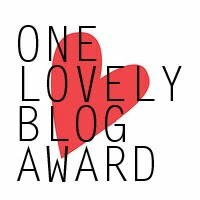 And I say this as a person dedicated and entirely wedded to kitsch. Even I have limits. 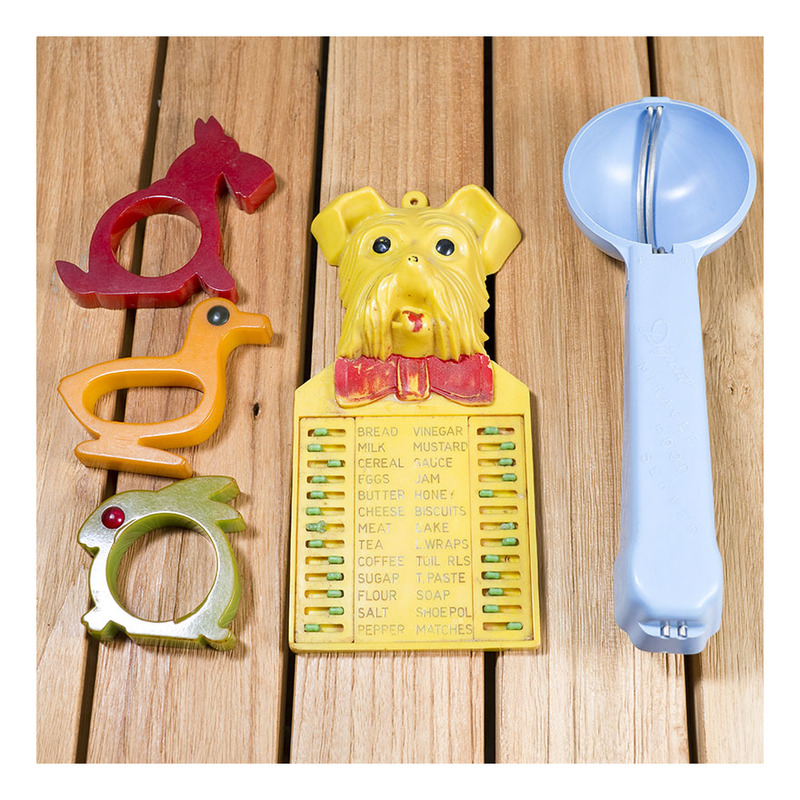 Bakelite could be produced in almost any colour, but was most widely produced in white, brown, green and red. It is a relatively stable product, but can be damaged by sunlight and over time oxidisation can cause colours to deteriorate. Blue bakelite can become a muddy green colour, and for this reason, blue bakelite that has retained its original hue is both rarer [and more expensive in vintage terms] and more collectible. ‘atomic’ salt and pepper shakers, made by ‘D’. There is very little space on the base of the S and P shakers for the manufacturer’s cast name, so all we know of the maker is the initial ‘D’. At lot of S & P shakers made in the 50s had this ‘atomic’ shape. The swirling blue colours in the bakelite is typical of the period; because bakelite is cast [rather than moulded] it allowed a variety of colours to be mixed together. My partner and I are taking a diversionary trip to Berlin and Barcelona for the next so many weeks. I am writing a paper on European gardens spaces, but will also have half an eye open for vintage and retro objects. Please peruse my accumulated posts on collectible Australiana. Should you require something, just email me: reretroblog@gmail.com and I will get back to you once the grand tour is over. Thanks for all your fantastic comments and support thus far…I will be sure to include some evidence of the tour in subsequent posts.